Beginning in September, visitors are once again welcomed into the Sea of Cortez to frolic with the fishes and swim with sea lions in the waters around Baja California Sur. After the regularly scheduled summer hiatus, the open waters are now open to travellers looking to get up close with the aquatic animals that call the Sea of Cortez home. Famously named ‘the aquarium of the world’ by Jacques Cousteau, the waters around La Paz are home to 39% of the world’s marine mammals and over 800 species of fish. 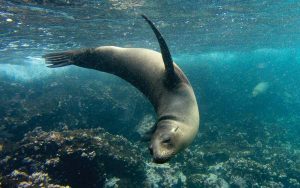 The sea lion colony that lives on a small rock formation called Los Islotes, located on the Espiritu Santo archipelago, is ready to welcome snorkellers and divers come September. From September throughout the fall and winter, curious young pups swirl around swimmers while moms and dads keep a close eye on them from the rocks. This is one of the only places in the world where sea lions and humans have friendly encounters. Orcas and other predators don’t travel to this area, so the sea lions have no reason to be shy. National Geographic even caught some incredible video footage of a sociable seal pup hitching a ride on a snorkeller. Hammerhead sharks also show up in the Sea of Cortez during September. Although sightings have now become less common than in previous years, divers flock to El Bajo, about 27 nautical miles from La Paz, to see the schooling sharks. During this season, divers witness an incredible phenomenon rarely seen – the schooling sharks always seem to travel in a clockwise direction. Hammerhead sharks are notoriously shy, so sometimes there may only be a handful in the area or there may be hundreds. If the sharks are scarce, octopus and giant pacific manta rays call El Bajo home year-round. This is an advanced level open water dive but professional guides with The Cortez Club lead tours into these waters. The following month brings a new season for La Paz’s main attraction: the whale shark. By October visitors are invited to hop into the waters around El Mogote, on the Bay of La Paz, to swim with the docile filter-feeders. Neither whale nor shark, the whale shark is the world’s largest fish and not at all dangerous to snorkelers or divers. Captains and guides adhere to strict rules of engagement with this endangered species – ensuring the whale sharks don’t become overwhelmed. Tour operators like RED Travel Mexico and Baja Adventure Co. are committed to sustainable eco-tourism and highlight harmonious animal encounters. These animals, and more, reside in the Sea of Cortez throughout the fall and winter. No matter which month visitors arrive they are treated to experiences with sea life that is unlike anywhere else in the world.